It gets better and better. 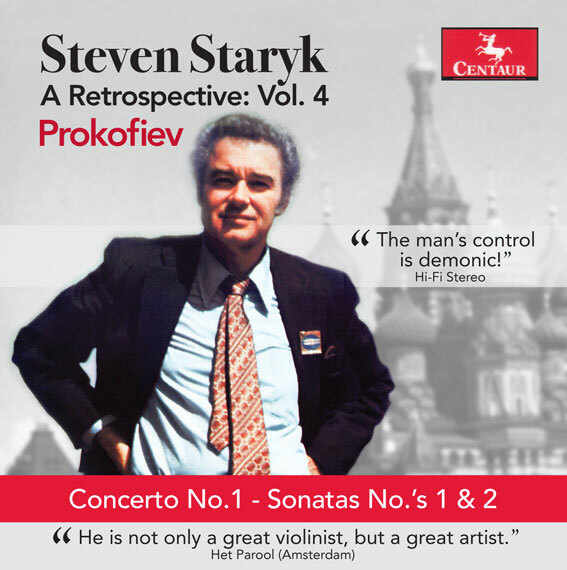 Volume 4 in the Steven Staryk Retrospective reveals the master violinist showing all this formidable arsenal of skills in the context of a very demanding all-Prokofiev program. Staryk’s demon control of dynamics, his spot-on phrasing, and his uncanny ability to always employ the right degree of tonal color for what he wants to say with the music at any given moment in the score, all receive ample play in a program that begins with the Violin Concerto No. 1 in D major, Op. 19, recorded live in October 1961 in the Amsterdam Concertgebouw with Bernard Haitink at the podium. This account of the Prokofiev First Concerto reveals the violin in its proper role (for Prokofiev) as first among equals, rather the virtuoso in the spotlight and playing against the orchestra, as it was typically cast in the Romantic era. Hardly anywhere, except briefly during the lead-back to the opening movement recapitulation, does the violin play by itself. That doesn’t mean there is no scope for virtuosity in this work. Quite the contrary. The violin pulls the orchestra up to its own level of virtuosity, so that the music making is all the more zestful. Here we have on display the bite and brilliance we expect from Prokofiev, but there is more. In Staryk’s hands, we have wonderful, abundant lyricism all through this work. It is not the deeply sentimental lyricism that pervaded the romantic concerto, but a cool lyricism that is all the more welcome because it occurs in the context of a thoroughly modern work. A work that could only have been written by a Russian. We hear it from the high, ethereal melody with a strangely calming effect in the very opening that builds in its cumulated effect and serves to define the opening movement, and in fact the entire concerto. A fantastic pianissimo passage, with the violin playing against shimmering textures in the orchestral strings and harp, stays in the memory for a long time. There is no actual slow movement, but moderato episodes in the finale serve to satisfy our need for one. This same finale is marked by a neat dovetailing of the violin soloist’s 3/4 time and the orchestra’s 4/4 accompaniment, bringing us back to the compound time of the first movement. The two Sonatas for Violin and Piano, No. 1 in F, Op. 80 and No. 2 in D, Op. 94bis, impress by their concerto-class complexity in the writing for the violin, the second no less so for the fact that it was re-arranged, at the behest of no less a figure than David Oistrakh, from the original version for flute. Sonata No. 1, begun in 1938 and finally published in 1946, is very moody, one of the darkest and most brooding of the composer’s works. The aptly named scherzo movement, Allegro brusco, is sensationally “brusque” and biting in its phrasing. The slithering scales heard at the end of the first and fourth movements were described by Prokofiev as “wind passing through a graveyard,” though the image of the composer whistling to keep up his spirits as he passes the graveyard might be a better metaphor for conditions during the Stalinist era. The Second Sonata, which Oistrakh premiered together with pianist Lev Oborin in Moscow in June 1944, is on the whole a more optimist, cheerful work, though its Andante was sufficiently full of deep feeling to have been played at Prokofiev’s funeral in 1953. The finale, with a terrific forte passage designed to lift listeners from their seats, has a joyous sweep and optimism that must have sounded just the right note for wartime audiences. "His playing was irreproachable, technically, tonally and musically."